With the flood of cheap (1) Chinese knock offs, (2) patent infringing copies, and (3) long time competitors that are simply less efficient; the answer is A LOT! One thing all three have in common is a poor sponge material design, which is also how costs are shaved! 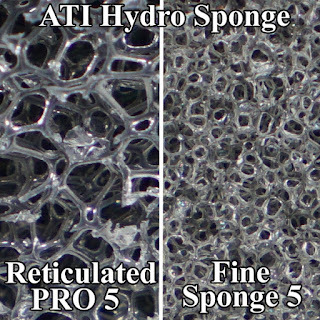 I have seen YouTube comments by persons who only know these sponge filters by the above noted categories, not by the use of a patented AAP/Hydro Sponge Filter. With a poorly designed sponge, much of the muck that is held by the sponge is trapped in the outer part of the sponge. A good test is when the sponge is removed, a good portion drips back into the aquarium if not removed very carefully. Then when rinsing, it does not take much to clean these sponges. With a patented AAP/Hydro Sponge, generally the same amount of muck might drip back into the aquarium upon removal, however the big difference is when rinsing and squeezing to get clean in a small bucket of used aquarium water (or de-chlorinated water), it often takes 2 or 3 water changes in this bucket for the sponge to come clean!!! The picture below demonstrates the high density of sponge pores found in a quality sponge. This is unlike most every other sponge which have more in common with the foam in your couch cushion! 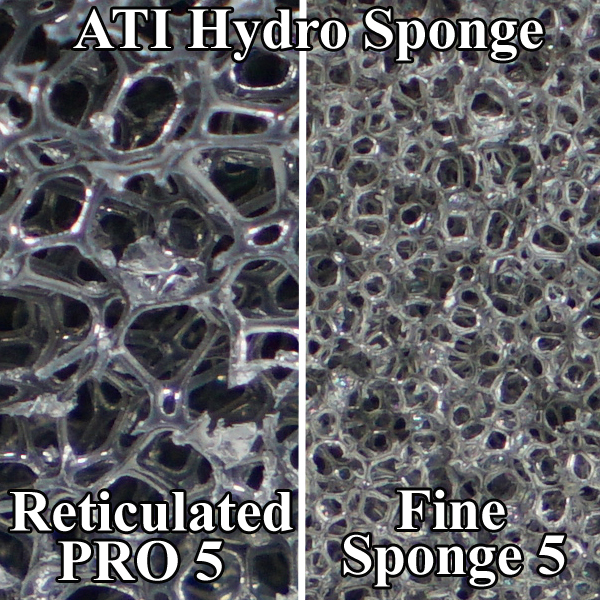 Patent infringing copies: Here we again still generally see a poor sponge used to save on production cost for much lower capacity of bio and mechanical filtration. HOWEVER because the patented interchangeable design has been copied, flow patterns and versatility are definitely better. Sadly Hydro-Sponge has ceased battling many of these companies infringing on their patent here due to time and money involved (not to mention that while AAP/Hydro Sponge is 100% American made, it is nearly impossible to stop patent infringement in China for low cost goods). What we can do is avoid these companies and stores that sell these. Unfortunately in our often social media driven world, we have aquarium marketing schemes de-jour such as "My Aquarium Box" actively promoting just one such patent infringer. We need persons in this hobby who will listen to others who have been around a long time to mentor them and and then follow the trail of truth.